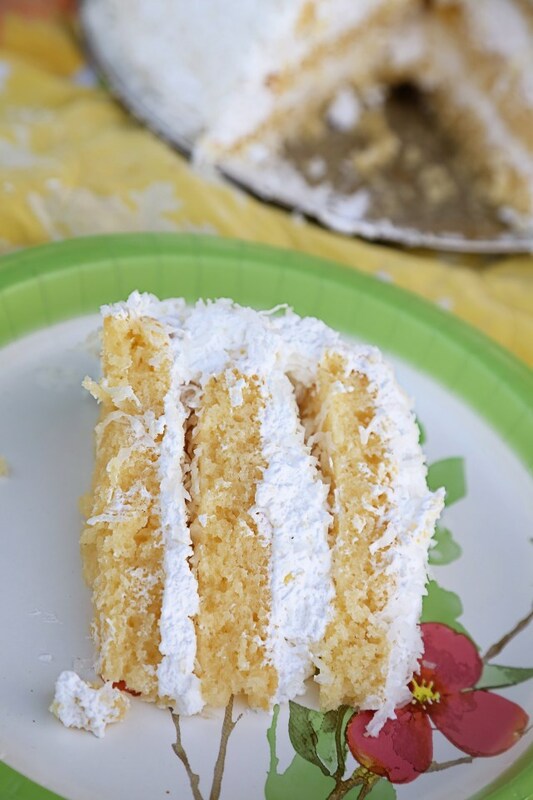 Amazingly dense, rich, saturated with coconut flavor with a light, fluffy, creamy frosting that only compliments and doesn’t overpower the rich, dense and super-moist cake. 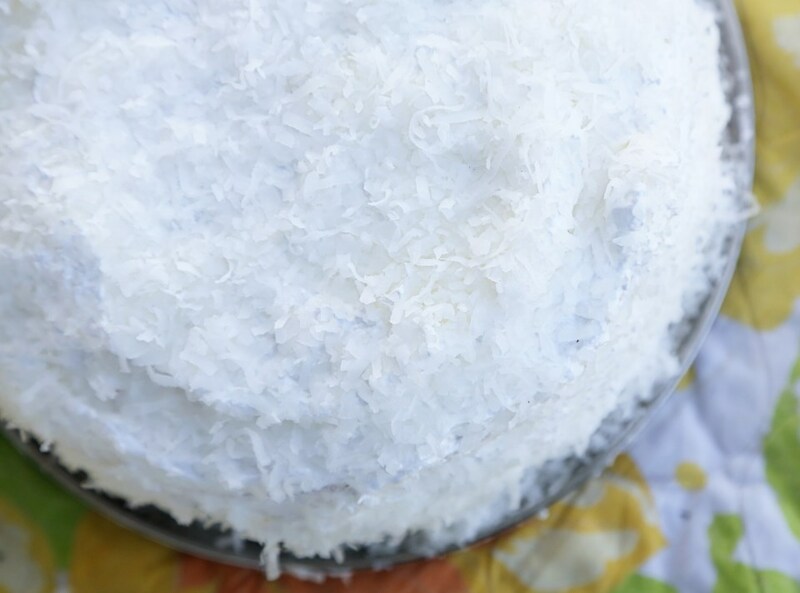 Yes, of course, this was the best coconut cake we’ve ever had. And why, is that? Because it’s Thomas Keller’s recipe, and as anyone who has ever heard of or seen one of his cookbooks will know, everything he touches is gold. This recipe, however, is not found in any of his cookbooks, but was featured in an article on Saveur magazine online. It was a recipe that took him back to his childhood, to having a cake very similar to this in a small town diner. We had this recipe bookmarked for months and finally gave it a go. While you can tell from the pictures that my layering techniques leave something to be desired, the flavors were amazing. Spot on. I even took it to a picnic in 80 degree weather and it held up (barely). This cake needs to be chilled the adequate time recommended, for sure. Even with my missteps and imperfect execution, it was one of the best cakes I’ve had in years. Go forth! Be bold! Make this cake! We changed nothing – this is just one of those “I made it, so can you” kind of posts, so I’ll simply copy the recipe for you, here! Happy Weekend! Make the cake: Heat oven to 325°. Grease three 9″ cake pans with butter and line with parchment paper; set aside. Whisk flour, desiccated coconut, baking powder, and salt in a bowl; set aside. Place sugar and egg yolks in the bowl of a stand mixer fitted with a paddle attachment; mix until fluffy. Add mayonnaise, coconut milk, buttermilk, coconut and vanilla extracts; mix until combined. With the motor running, slowly add dry ingredients until batter forms; transfer batter to a bowl and set aside. Clean stand mixer bowl and add egg whites; replace paddle with whisk attachment. Whip whites until soft peaks form; fold into cake batter. Divide batter between prepared pans, smoothing tops with a rubber spatula; drop pans lightly on a counter to expel large air bubbles. Bake until a toothpick inserted in middle comes out clean, about 25 minutes. Let cakes cool for 20 minutes in pans; invert onto wire racks and let cool.Make the meringue: Using an electric hand mixer, beat egg whites in a bowl until medium-stiff peaks form, 5–7 minutes; set aside. Bring sugar and ¼ cup water to a boil in a 2-qt. sauce pan fitted with a candy thermometer; cook, without stirring, until temperature reaches 250°, 4–5 minutes. With the mixer on low, slowly drizzle hot syrup into egg whites until combined. Increase speed to high; beat until meringue forms stiff peaks, about 3 minutes more. Assemble the cake: Place one cake layer on a cake stand and spread 3 cups meringue over cake; sprinkle with ¼ cup coconut. Repeat with second layer. 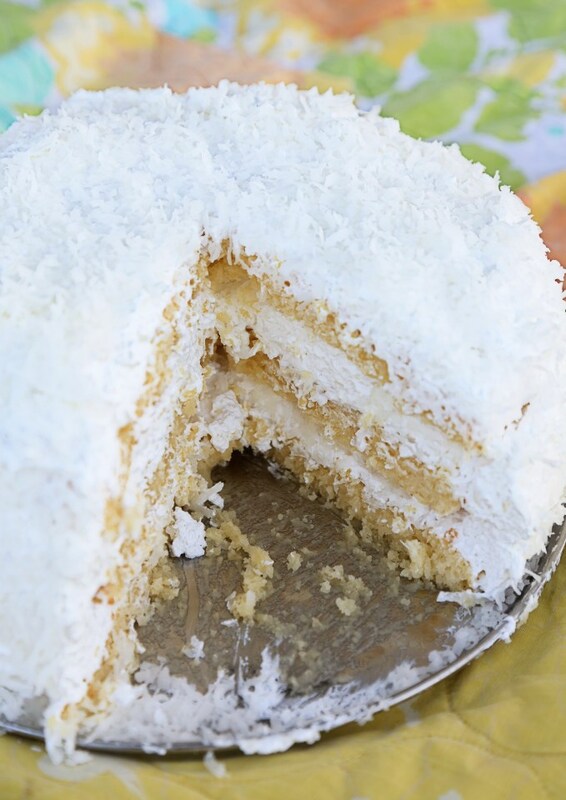 Place remaining layer on top; cover top and sides with remaining meringue and cover outside of cake with remaining coconut, pressing lightly to adhere. Chill cake 30 minutes to firm meringue; serve chilled or at room temperature. This entry was posted in Baked Goods, Christmas Dishes, Desserts, Eggs are Awesome, Uncategorized, Valentine's Day, Weekend Fare and tagged birthday cakes, cake, coconut, coconut cake, desserts, layer cakes, Thomas Keller's coconut cake. Bookmark the permalink.